Attend a product demo for a high-level introduction to Kaseya and see for yourself what Kaseya can do for MSPs and IT departments and why over 50% of the MSPMentor Top 100 MSPs use Kaseya. 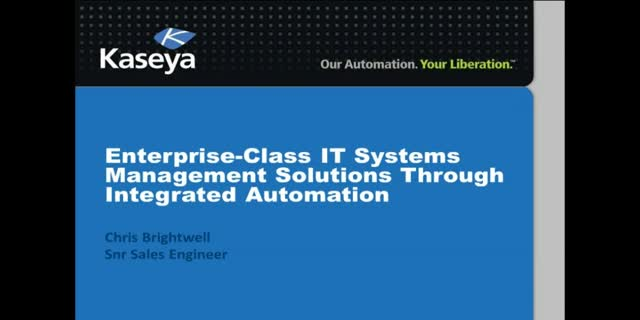 Kaseya is the leading global provider of IT Systems Management software. Our solutions empower everyone - from individual consumers to large corporations and IT service providers - to proactively manage and control IT assets remotely, easily and efficiently from one integrated web-based platform. Don’t miss out on your chance to learn more about the industry's ONLY "all in one" IT service management solution. Trends like the cloud, software-as-a-service (SaaS), social media, mobility and consumerization of IT drive an increasing demand for a user-centric IT. To fulfill this demand while at the same time increasing IT's efficiency, IT organizations need to look beyond the traditional help desk when searching for ITSM tools. Just throwing more functionality and capabilities on the help desk cannot live up to the new way that users want to deal with IT and related services. In this session we will discuss how this translates into 3 reasons why IT organizations want to look beyond the traditional help desk in search for ITSM tools: achieve a higher maturity to deliver and support high quality services, become a more efficient IT organization and meet user expectations risen from how users interact with IT services day-to-day via mobile devices and social media. Finally, we will discuss what characteristics an integrated ITSM solution should come with when looking beyond the help desk. You may be trying to decide if it’s time for new IT Service Management solution and you, like many of your peers are faced with a number of challenges being placed on IT departments every day. As part of that decision making process, you’re also probably questioning what compromises you may need to make to overcome those challenges. Questioning whether it’s more important to focus on lowering costs OR try to improve service quality; or deciding on a point solution OR one that can grow with you down the road. And on top of that, you’re probably also thinking about whether to deploy your solution in the cloud OR on premise. Decisions…decisions…. But wouldn’t it be nice if you didn’t have to pick one OR the other? Let’s take a look at how HEAT Hybrid IT Service Management solution delivers on the promise of a truly integrated service delivery life-cycle solution make a real impact to your business without having to make any compromises. Is there anything new under the sun? CA Nimsoft Service Desk provides a new paradigm for Service Management. It delivers essential, end-to-end Service Management in a powerful but flexible solution. The focus is less on the toolset and more on how that toolset helps the support organization achieve its objectives. Driven by the convergence of several trends in the IT Service Management market, the core principles of CA Nimsoft Service Desk include Software-as-a-Service (SaaS) delivery, easier implementation and maintenance, “pragmatic” ITIL, usability, collaboration and lower total cost of ownership. Ian Power, has worked for CA Nimsoft for over 18 months, specializing on CA Nimsoft Service Desk. Previously he worked for a Service Management Implementation partner for 4 years where he did Pre-Sales, Process Workshops, Project Scoping, Implementation and Project Management. He has also worked in Technical Support and Help Desk roles in the Financial and Consumer Electronics industries. Ian has lost many illusions about Service Management in the place where ITIL meets the real world but still believes a correctly chosen, properly implemented toolset can add massive value to an organisation. Ian once scored 52 goals in a single season and compered a rock concert. Apart from that he is terribly ordinary. Simon Kent, Head of Business Professional Services, Cherwell Software. Simon is a veteran of the IT Service Management software industry reaching back 19 years and 26 years in IT. He builds upon his experience as former co-founder & co-owner and Director of Customer Services at ICCM, augmented with the longevity and experience of service management software consulting with hundreds of clients across multiple sectors, organisational structures and business operating models. He is a fervent campaigner of common sense, team work, process improvement and efficiency focused on increased customer adoption, customer success and business relationships. With the amount of ITSM products in the market, it has become challenging to decide which tool is right for your organization. Join this "demo" channel to explore the capacities that the IT Service Management vendors have to offer and to obtain a comprehensive view of the latest solutions available.